Please note – these are old installations instructions, only valid for ReX packages without embedded JRE (ReX versions < 0.8.X) and ReX.Cell – for newer versions, please refer to the updated instructions! Following are step-by step instructions for installing and running ReX on the supported operating systems. First of all, make sure you have Java installed on your system – ReX requires a Java Runtime Environemnt (JRE) or Java Development Kit (JDK), version 1.6 or higher. Installation instructions depend on your operating system; for Windows and Mac OSX systems you need to download it from the official Java website. Modern linux distributions should include a JRE or JDK by default; if not, you may choose to install Oracle’s default implementation or the OpenJDK one. In general, you need to make sure that the JRE architecture corresponds to that of the package you download (e.g. to run ReX 64bit you need a 64bit Java runtime). 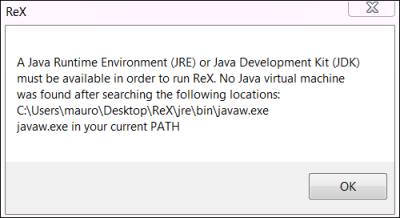 Finally, please notice that, since ReX is a normal deskop application, to run it you don’t need to enable the Java plug-in in your browser, something that has lately been pointed out as potentially dangerous. (Optional – windows only) on some Windows systems, you need to download and install the Visual C++ 2010 runtimes – since this is a basic requirement for several windows applications, chances are that it is already present on all but freshly installed operating systems (it is reported in the “Installed applications” applet in the control panel). If ReX is unable to perform any computation or behaves erratically on windows, this is likely the problem. After dowloading the ReX package corresponding to your operating system and architecture, decompress it in a folder of your choice. Start the program by double clicking on the ReX program icon (the actual executable name varies depending on your operating system). 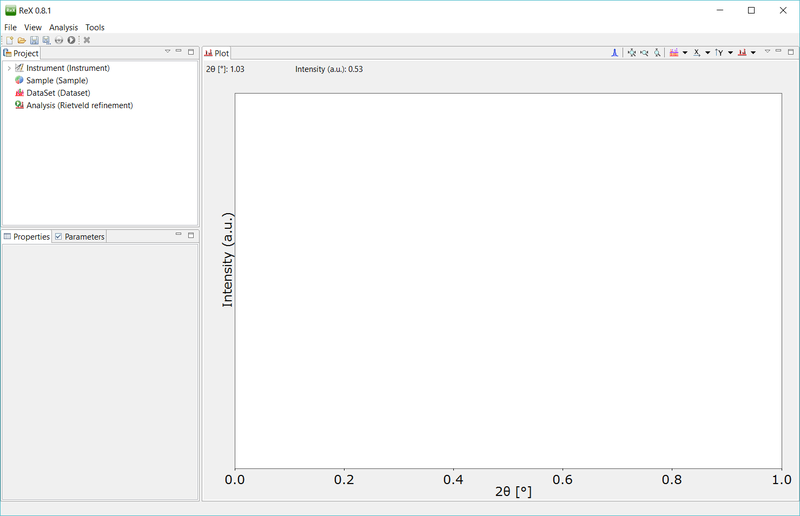 The main application window will appear, showing the default view layout (perspective), containing the project tree view, the dataset plot view, and another tabbed view containing the properties and parameters view. Most installation issues are related to a missing/incorrect Java Runtime Environment; following are some platform specific instructions on how to determine the exact origin of the problem. This can also happen when a Java version with a different architecture is installed on the system (e.g. ReX 32 bit trying to run on a 64 bit virtual machine). In either case, downloading and installing the correct Java Runtime Environment solves the problem. In this case, the solution is to download and install the correct runtimes for your system (32 or 64 bit) from the Microsoft website. Otherwise, a “command not found” error will appear. Please notice, that only 64bit systems are officially supported, so if you happen to have an older 32 bit Apple JRE installed, ReX could still fail to start. In either case, go to the Java website and download the Mac OS X version of the Java installation package. The important thing here is to match the JRE architecture with the program one, e.g. if you downloaded ReX 64bit you have to pair it with a 64bit Java Runtime. You may install the latest JRE by downloading it from the Java website, or directly from you preferred package manager.